Got a picky eater? 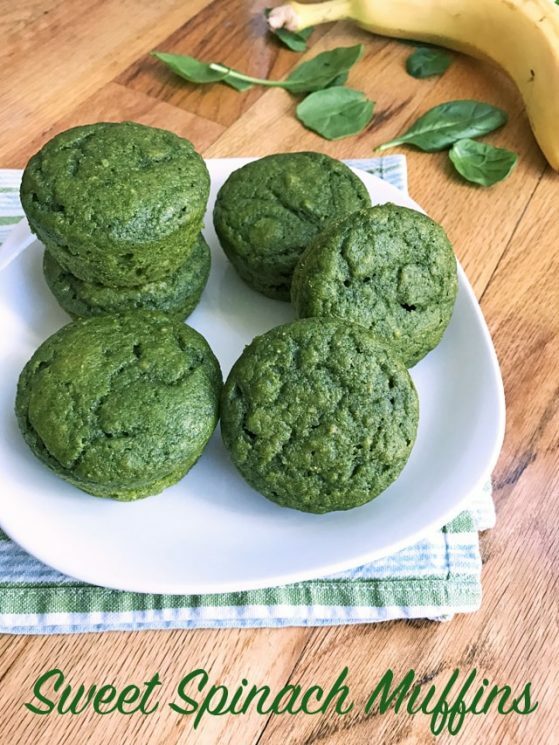 These kid-favorite muffins are 100% whole wheat, refined-sugar-free, and packed with fresh spinach! “I like all the muffins you make, but these ones are my favorite.” My kind (and diplomatic) kindergartner told me this last week, after I served him a warm, buttered Sweet Spinach Muffin. And I have to say, that boy has good taste. 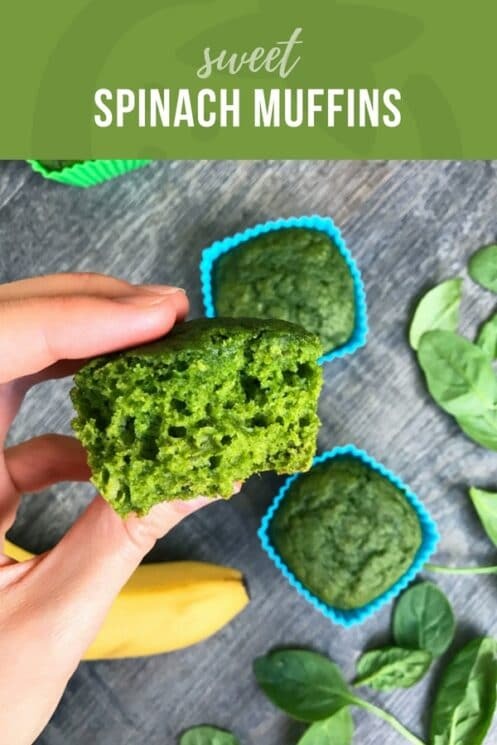 These muffins are addictively delicious, and chock full of fresh spinach to boot–an entire bag of it! 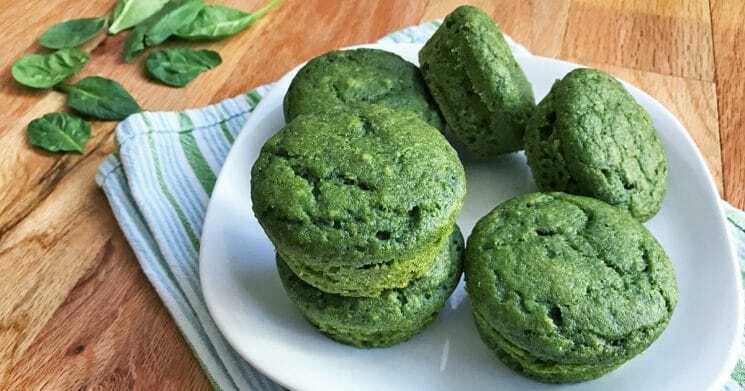 Speaking of the spinach, don’t be fooled by the verdant hue of these muffins; the greens don’t make waves, flavor-wise. Instead, the taste is sweet, cinnamony and moist, like a treat you’d serve with a cup of tea. This is true even though we only use half the sweetener you’d find in most muffin recipes. There’s more goodness packed into these muffins: 100% whole grains, creamy banana, eggs and whole milk. Plus they’re portable, freezable, and easy to eat with your fingers… I’m not trying to gush here, but did we just discover the world’s most perfect kid food? Some kids might shy away from the green color of these muffins; my daughter is one to reject a food just by the look of it. That can be aggravating, of course, but it’s a fact of life when feeding kids. 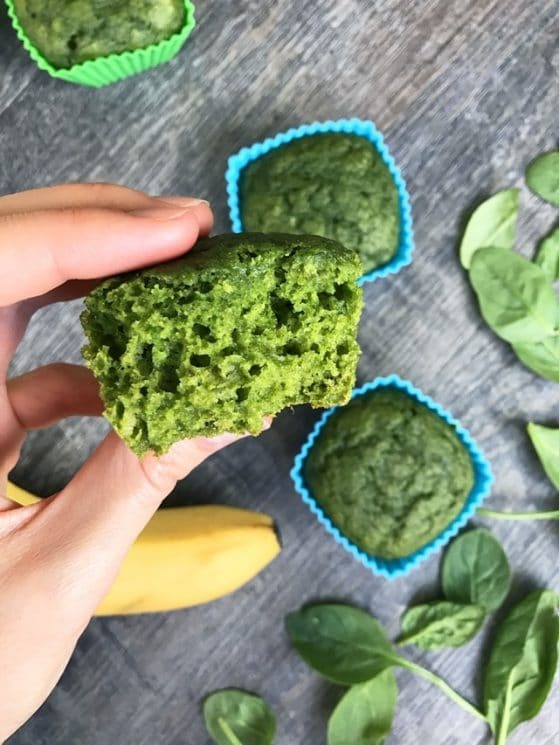 Whatever you call them, be sure to tell your kids that these muffins are filled with spinach–tell them the spinach is what makes them so moist and colorful! That way they’ll know they love spinach, at least some of the time. Oh, and my picky daughter? Obsessed with these muffins. When you’re ready to whip up these gems, have your blender ready. All the wet ingredients get pureed together, so you don’t have to worry about mashing the banana or whisking the egg separately. Then just pour the wet ingredients into a bowl of the dry ingredients, and fold them together gently. It’s super quick and easy! We like the flavor best when the muffins have had some time to cool. We store the leftovers in the refrigerator, where they have never lasted more than a couple of days! I hope you love these muffins as much as my family does. Here’s to you health, and happy baking! Hi! These look great. What can I use in place of the honey? Hi Kate! I haven’t tried sweeteners besides honey, so I can’t promise they’ll work in the recipe. But you could probably substitute pure maple syrup or plain sugar. If you try it, let us know how the muffins turn out! I’ve done these using 1/2 cup of white sugar instead of honey and they turned out great. I added the sugar to the dry ingredients instead of in the blender with the wet ingredients. Hi! I just made these and they are delicious!!! I used 2 medium bananas and 1/3 cup pure maple syrup in place of the honey. Wow! They turned out perfect!! Absolutely delicious!!!! Hi Blima! I haven’t tried frozen spinach. I would think it would create a very different texture. But if you try it, let us know how it turns out! We used frozen spinach and it worked sublimely! Did you use the same amount of frozen spinach? Did you omit any liquid from the recipe since the frozen spinach had more water content? Is it only three-fourths of a cup of spinach or is it 3 to 4 cups of spinach? The narrative did say a whole bag, but I just want to check. These look great! Definitely 3 to 4! Just made them and they’re perfect! These look soooo darn good. I’ve already pinned it and printed the recipe. Making it this weekend. BOOM! I have the same question as Jen. I put in only 3/4 cup spinach as the recipe says and my batter is nowhere near as verdant as your photos. Reading back on the post you do mention a whole bag…thanks! Good muffins. Not sure I’d slather more butter on a muffin from a recipe that calls for a whole stick of butter though! I had similar issues – I used 6 oz of frozen spinach and while they taste great – similar to a zucchini muffin – they aren’t exactly green! Could you clarify the spinach quantity please? Hi, Sarah! I’m glad you got tasty muffins, even though they did turn brown for you. I used fresh spinach, and I think that’s why my muffins stayed bright green. I have also found that if they cook too long, they can brown on the outside (even though the middle stays green.) I hope this helps! I put in much more spinach (1.5 loose cups maybe?) and they are greener, but still not as green as your pictures. I think I could add even more! Where do you add the spinach? In the blender with the wet ingredients? Yup, right in the blender! I love how GREEN these are!!! How did you get them green? I used a bag of spiniach but mine are brownish not bright green. Thanks! I’ve made these twice and my kids love them! However, mine are turning out more brown than green. How do I get them green? Thanks for the reply! The food processor I was using didn’t purée the spinach well enough. I switched to a blender and they’re green! Thanks, again! Have you tried any with a gluten free alternative to flour? Hi, Melissa! I haven’t tried a gluten-free flour, but it would probably work. Let us know how it turns out! flour and they turned out great! What was your amount of oat flour? These are so good! My toddler has decided he doesn’t like spinach anymore, but he’ll eat these! The whole family loves them. Thanks so much for the great recipe! Jessica, I love this! Thanks for sharing. Could you use Apple sauce to replace the egg? Sandy, I’m really not sure,since I’ve never tried it. If you do, let us know how it turns out! Yes! I like to freeze them to throw in lunchboxes. They thaw out and taste great. When you pack a frozen muffin for lunch, do you take it out of the freezer the night before, or the morning of? Thanks in advance! Kelli, I would take it out of the freezer the night before and let it defrost in the refrigerator overnight. If you do pull it from the freezer in the morning, you might just want to warm it slightly before packing it. Can I use regular flour in the same amount unread of the whole wheat? I’d like to make these right away but don’t have whole wheat flour. Thanks! I just made these tonight, and my husband and daughter (neither of which are veggie lovers) LOVED them! Hubby ate two right away. I used organic Agave nectar instead of honey, and vanilla almond milk, so I omitted the vanilla extract. So yummy and filling! Last week I did the spinach one and it was not so green like yours but was delicious. My kids loved them! Today, instead spinach I used beets for a pink color since we are close to valentine’s day and it was amazing! Love this recipe! Hi Tania, saw that you posted subbing spinach with beets. Just curious what kind of beets you used. Raw or cooked and how much? My two year old is a very picky eater. She refuses anything green. Her favorite color is pink she will at least give it a try. Thanks! Hi Tess! I’m not sure how to sub beets into this recipe, but we actually have a yummy muffin recipe with beets in it that you might like to try, here: https://www.superhealthykids.com/whole-wheat-strawberry-beet-muffins-recipe/ Tell us what you think! Yes i did that and they were delicious ? Do you put the butter in the blender with the wet ingredients? If so, is it melted butter or just softened butter? Hi Sarah! We melt the butter in the microwave and pour it right into the blender with the other wet ingredients. Great making them right now, thanks!! Can i replace the milk with almond milk or soy milk? What if don’t use baking powder and baking soda ? Is a good Idea replace butter with avocado?? Any idea on the nutritional information of the muffins? I’d like to know carbs, sugars, calories. Thanks!! Hi, Katy! We haven’t calculated this recipe yet, but you can do it at nutritiondata.self.com by using their recipe feature. I hope this helps! It is approximately 140cal per muffin (20g carbs 6g fat 3g protein). The calories pretty much all come from the flour, honey, and butter. These turned out wonderful! I used my NutriBullet for the wet ingredients — and named them “Bobgoblin Muffins” after my 3 yr olds favorite green mischievous goblin on Wallykazam. Thank you so much for helping me get greens into my toddler! I made these for green eggs and ham day at my daughters school and my whole family loved them! I used 1/4 c coconut oil and 1/4 c applesauce instead of butter and used about 1/3 c maple syrup instead and honey and they were great! Thanks! Thanks Tara! I was just going to ask if anyone has tried using a butter substitute successfully. Awesome recipe! I subbed simple syrup for the honey to make them baby friendly, and used liquid coconut oil instead of butter. They turned out super yummy, fluffy and green! I will definitely be making these again! Any ideas for a banana substitute? Perhaps an avocado or two? I used half baby kale and half spinach. I steamed it first and then pressed the water out bc I thought that would limit the veggies taste more. When I noticed the color was a little weak I added a handful more of fresh. Color is pretty good! I also used 1/2 cup of butter-flavored coconut oil (Nativa) instead of butter. I also used 1/2 cup of date sugar instead of honey (plus a few dalops of maple syrup). I used unsweetened vanilla soy milk instead of dairy milk. They are great! Next time I’ll try oat flour and throwing in some chia seeds too. I look forward to making them again! I know you say a whole bag but I have a Costco sized bag… Do you know how many cups of fresh spinach it works out to for the recipe? Today I weighed but so I can add to my recipe for future times when I may not have a scale handy? Thanks! I’m going to try them on my two-year-old grandson tomorrow (for whom I really made them), so I’ll let you know how that goes. But if he doesn’t like them, I’ll finish them off! Just made these for the second time. They were great the first time following the recipe exactly. This second time I decided to get adventurous and subbed applesauce for the butter. They turned out great! They are maybe a little more chewy in texture, but still soft and fluffy. I also stirred blueberries in half of the batter and sprinkled a little organic turbinado sugar on top to balance the tartness of the blueberries. I thought they were tasty, but my kids preferred them plain. Thanks for the fun, tasty and healthy recipe! Love this recipe thanks!! My more adventurous eater, loves them green. But my pickier 5 year old was convinced she didn’t like them despite my best marketing. So I add 1/3 of a cup of unsweetened cocoa powder and an extra banana to off-set the additional dry ingredient. They come out a deep chocolate brown. Picky 5 year old now begs for seconds!! Thank you for your suggestions! My nieces are some of the pickiest eaters I know. I will definitely try these to see if I can “trick” them into eating some greens! Just made these…in the oven now. I substituted the banana with 3/4 cup of unsweetened apple sauce as I don’t like bananas. Now, I am a bit concerned because I did not use the whole bag of spinach. I looked up the conversion and used about 1 cup? The batter was very green so I’ll have to see what they look like when cooked. Just made these! They were a hit with my kids. I used maple syrup instead of honey so that my 10 month old could have some…Also, I did Mini Muffins, same recipe just baked for 14 minutes instead of the 18-22. I would love to try adding applesauce or something a little more binding to the recipe since they were a little on the fragile side/falling apart really easily. I would also love to try grinding oats instead of the wheat flour! I just made these for the first time tonight and they are sooooooo good!! Thank you! so, I am a newbie at this baking stuff, so pardon me for asking a potential dumb question. Does the spinach have to be raw or cooked? Hi Ash, good question! The spinach in this recipe is raw. 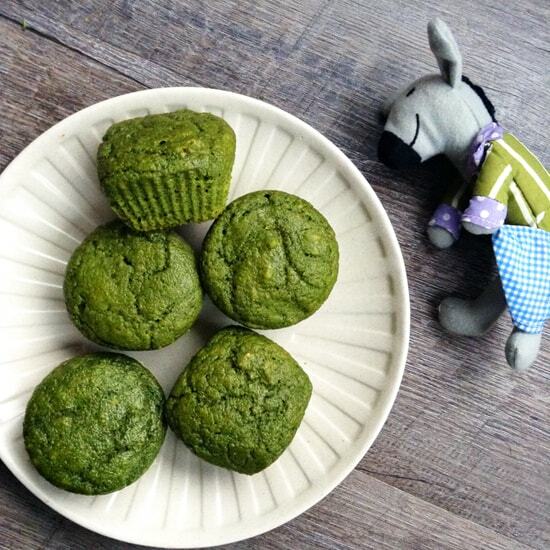 Use one whole bag (about 5oz) of fresh, raw spinach to get the muffins to be super green. I have tried to make these twice now. First time i used almond flour and almond milk and followed the recipe exactly as it was written. The muffins were way too wet and didnt rise. The second time i used coconut flour ans almond milk, and they were too dry. 🙁 has anyone else had this problem?!? Is there a reason you didn’t want to try it with regular flour? From my experience almond flour and coconut flour absorb liquid and isn’t a great substitute for regular flour. I made these today and actually forgot to put the butter in and they still turned out wonderful. I added two cups of frozen blueberries to make blueberry muffins. Thanks for a great recipe. How do you store these? Do you put them in the refrigerator or in a container on the counter? Hi Meghann! I store them in the refrigerator and eat them within a few days. If I want them to last longer than that, I pop them in the freezer. They defrost and taste as good as fresh! I only had 3oz oh spinach in fridge however I had some kiwi to make up the difference, they were not as green as the result however they tasted delicious. I also added some dried cranberries and chopped walnuts to the mix, awesome!!! HELP! I’ve tried to make this twice now, both times with the same result. My “batter” looks kinetic sand.. moist but definitely too crumbly and not even to a consistency that I can spoon. What am i doing wrong ?? Hi Michelle! I’m sorry they’re not turning out for you. Since it sounds like your batter is too dry, the first thing I’d do is double-check that you’re adding the ingredients in their proper amounts… if you have too much of the “dry” ingredients and/or not enough “wet” ingredients, the consistency would be off like you describe. I can’t imagine what else would give you that wacky texture! I hope the third time’s a charm! Do you think I could make a bread out of thus vs. Muffins? My daughter has low iron. These have have been an easy way to boost the iron in her diet. I used orange juice instead of milk. Vitamin c boosts iron absorption into the body. They turned out great! The whole family liked them. I made this tonight and they are excellent! These look great. In fact I am about to make a batch right now. I noticed that some people complained of getting a darker color muffin. maybe it’s the wheat flour. Did you use wheat to soak up the moisture? Is it possible to use all purpose of half and half? Hi Bahar! You could probably use all-purpose flour in place of whole wheat and still have the recipe turn out. We like whole wheat flour because it has better nutrition than all-purpose. But half whole wheat and half all-purpose might be a good middle ground! Ah I wish I could add an image of ours! They turned out perfectly and my son is calling them the Ghecko Green Pj Mask muffins. He is 3. I used half honey, half sugar, I didn’t want to finish my honey and I used coconut oil instead of butter ( which is overpriced and scarce in South Africa at the moment.) I used frozen Swiss chard and the colour is perfect! Oh… we also added some chocolate chips for fun! Thanks for this brilliant recipe! Hi Jen! I love the name your son gave the muffins, and we’re so happy they turned out so well! Thanks for sharing the adaptations you made! Those sound yummy! I have them in the oven now! Did a lot of subustutions and adds. I subbed Costco power greens for spinach. 2 small apples and a carrot for banana. Added 3 TBS of chia seeds and about 1/3 -1/2 cup of ground flax seeds. Also made them into mini muffins. They are a beautiful green! I am guessing on how long. to bake as I went “rouge” on greens andfruit and almond milk. Just tested one and it needs a little more time, it was delicious! Thanks for the recipe! Hello, did you use the chia seed and flax seeds to replace the egg? I am wondering how the muffins would be with chia or flax as an egg replacer. Can I substitute milk for water and the egg for apple sauce? Can I use sunflower oil instead of butter? Would you have a suggestion for using coconut flour instead of whole wheat flour? I just made these with regular flour instead of whole wheat. They’re tasty. But you can’t hide that there’s fruit/veg in there. You can smell spinach & banana when they’re hot. Plus the texture is denser & more rubbery than regular cake. If I started again I’d use wholemeal & ditch the banana I think. Can another flour replace wheat flour? If so could you suggest one ? I tried these last night following the recipe but adding a few mini chocolate chips to each muffin. They were DELICIOUS! my 7 year old even asked for seconds!! Thank you!! I substitute wholemeal spelt flour 1:1 for whole wheat flour and they work great! I use baby English spinach leaves, is that what the original recipe uses? Tia! Thanks for sharing, Amy! Yes, I also used baby spinach leaves in the original recipe. If I added some shredded carrot and zucchini in these would it make much of a difference to the flavor or cook time? How would I freeze these? I made these with a tablespoon of flax in 3 tablespoons of water to replace the egg, vanilla almond milk instead of the milk, apple sauce instead of the oil, and maple syrup instead of honey. We have dairy and egg allergies, and I didn’t have any honey on hand ?sooo tasty! Thank you for sharing! Can you freeze the batter? I would Like to make these for my 12 month old using a mini muffin tin. How long would you bake them in a mini tin?? Hi Breelynd! I have made these in a mini muffin tin before, and they work great. I don’t remember the exact length of time I cooked them, but I suggest checking the mini muffins after 15 minutes in the oven. If they’re dry and firm to the touch, they’re ready to come out. If they’re moist and sticky, leave them in for another few minutes. I hope this helps! I used frozen spinach and it turned out great! I subbed coconut oil for the butter and used soy milk. My less picky kid and the grownups think they’re yummy. These are wonderful! I made them with spelt flour and 1/4 cup of agave. To me they probably don’t need the added sweetener as they are getting a lot of sugar from the banana! Love this recipe. My toddler is on a muffin kick right now and we don’t do refined sugar. I just made these this morning and they turned out perfect and green!! My toddler who hates veges ate 4 of them! I used regular all purpose flour as I didn’t have any whole wheat. I substituted 1/2 stick of butter with 2oz unsweetened applesauce and used only 1/3 cup of honey as we don’t like our food too sweet. They were perfect and so fluffy & moist. Thanks for the recipe! 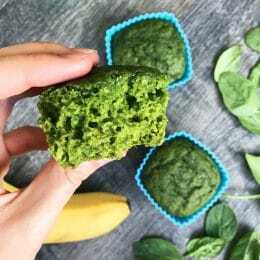 What is a good substitute for bananas in the sweet spinach muffins recipe? I made these today and they didn’t turn out green like yours – more of a brownish-green. I saw the recipe said 6 oz of spinach, and when I googled to find out how to measure 6 ounces of fresh spinach, i found it was 3/4 cup. I feel like maybe that was where I went wrong? Did I need to use more spinach? Hi Meaghan! It does sound like 3/4 cup would be too little spinach. The easiest way to measure out 6 ounces is to buy a 6-ounce bag of fresh spinach, and use the whole thing. Most stores sell bagged fresh spinach in that amount, or roughly so. I hope this helps! My toddler eats barely anything, and he is currently on his second muffin in under 10 minutes! Thanks for the great recipe. My daughter is allergic to eggs…any idea of a suitable substitute? I made a batch with the egg just omitted as i couldnt wait to try it out. My son is in love with these! He is 2.5. We make a few substitutions and these are awesome. -sub 1/2 avocado and apple sauce (small container) for the butter. -when they are done we “frost” them with apple sauce right before eating. They freeze well too. I wonder if I could use canned pumpkin instead of banana??? My kids aren’t big fans of the banana taste in muffins. Do you think pumpkin would work??? Hi Michelle! I haven’t tried this substitution, but my thoughts on pumpkin are that the texture would work, but you wouldn’t get that boost of sweetness. You could try subbing applesauce, but I haven’t tried that myself, either. (For what it’s worth, we don’t think the muffins have a distinctive banana taste with just the one banana. Might be worth a try with your kids. 🙂 Hope this helps! Followed directions even though we had to use salted butter (all we had) and they still turned out great! My kids thought they were pretty cool and ate tgem up (4 yo and 6 yo boys). Thanks for this easy, good for us recipe. These were awesome. My EXTREMELY picky 5 year old loved them. I obviously had to distract him while I was blending wet ingredients and called them “green goblin” muffins. I did add about 3 tblsp of sugar just to ensure that he would think they were sweet enough as well as added a crumb topping. Great recipe! I wish I could print off this recipe or copy and paste it to my notes. A little frustrating. We absolutely love these! Made them many times. For variation we sometimes add blueberries or raisins. They make a beautiful Christmas treat topped with cream cheese and strawberries. Has anyone has ever tried this recipe as pancakes? I’m curious if that would work. I tried these for St. Patrick’s day. Both my husband and I felt sick after eating them. I’m not quiet sure if spinach was supposed to be pre-cooked for adding to this recipe..it doesnt say in it. Lovely…..I used a brown rice gluten free flour for 1 cup, then 1/2 cup oats & 1/2 cup whole Wheat. And to balance that out added 1 heaping tablespoon of a blend of chia-flax-coconut. Oh, and used 1/2 buttermilk for the milk. Did a lot of adapting, is fun, so we’ll see! I subbed an equal amount of oat flour and it turned out really gummy… I am so sad 🙁 My friend made these and she used whole wheat flour and hers turned out perfect. I only used oat flour because I have celiac’s disease and can’t have wheat. Suggestions anyone? I just made these muffins with my kids and they turned out amazing! I didn’t have fresh spinach so used 6oz frozen spinach. I also used 1/2 cup coconut oil instead of the butter. Even with those substitutions the muffins turned out great! Will be making again and again God-willing. I’m curious, when using the frozen spinach, do you thaw and then squeeze out the extra water before adding to the blender, or do you just dump the whole package in and don’t look back? These muffins are amazing! I sub out 1/2 of flour for wheat bran and use almond milk. I have two girls that request “Hulk muffins” at least once a week. I usually make a double batch and freeze them. Perfect for busy school mornings or a quick snack. Thanks so much for sharing. Did anyone else’s muffins stick to the baking liners?? I have made these following the recipe and substituting plain Greek yogurt for the butter, and both ways were great. The Greek yogurt saves you some calories!! Now I just have to figure out how to come clean. :/ I want them to embrace that healthy foods ARE delicious!!! The recipe says 6 oz of spinach, please change that into a cup measurement. I used 3/4th and they are not green!! Hi there! I was wondering: How many of these muffins are a good serving size for a 3 year old? I plan on making them soon 🙂 They look awesome for my little Hulk fan. Every kid is unique in their appetites and energy needs. But I have a 3-year old, too, and I serve her one muffin in a sitting. My 7-year old eats two in a sitting. I do like to pair it with a protein like cheese or eggs, for balance. I actually make these a lot! they are so great! however, i have found that i can add waaay more spinach than what is asked for AND i can cut the amount of butter down by at least half. this recipe seems very forgiving. Love love love your muffins. I do want to say the thing I love the most is that once you learn the consistency of the batter and you can add whatever blended veggies or fruit that you have on hand instead. That being said, do you know how much roughly the blended portion should be (banana & spinach)? I just made a batch. My son is constipated so I did a prune and spinach version instead. I use 1 cup whole wheat flour and 1/2 cup of ground oats (oat flour) and I completely forgot the oil. My son is still eating them up. I love your recipes, you are fabulous :)!!!! I just made these and they’re great. I have a question. The description says there is a whole bag of spinach but the list of ingredients says 6 oz spinach which is less than a cup. Can you confirm how much spinach to use? I used a few generous hand fulls. They aren’t as green as the picture but I used more than 6 oz. Mine are in the oven now. I used a gluten free flour and agave, hoping they just are as yummy. I made these in 12 normal muffins and 12 mini muffins. I swopped butter with rice bran oil and honey with 1/3 cup stevia. They really taste like muffin and nothing spinachy at all. Great sweet option for the lunch box. Both bubs loved it. How long to bake if i do mini muffin tin? Excellent recipe! My 2 yo son loves the muffins. Thank you! Grouchy Muffins. They look great! My LO can’t have bananas, any recommendations what I could swap it out for? You can substitute 1/2 cup applesauce OR 1/2 cup avocado OR 1/2 cup plain yogurt. Made this for the first time. It went well and my 17 months old son liked it. Just wondering if I can freez this. Did anyone try? Yes we have frozen these and they reheat perfectly! So moist! My almost two year old is currently devouring his second mini muffin. Gave it 14 mins. Second batch is in the oven now. Thank you! I’m always looking for ways to get my little one (and myself) tasty and healthy ways of eating spinach. These are definitely one of our most popular recipes. So glad you liked it! These look really good! My son can’t have dairy, what would be the best substitute for the butter in this recipe? You can substitute with applesauce or oil. The ratio for applesauce is half of the amount of applesauce as the amount of butter called for in the recipe, and with oil substitute 3/4 cup of vegetable oil for every 1 cup of butter called for. These were super easy to make and turned out delicious! The only thing I did differently was add about a cup of chocolate chips. They tasted best on the first day after cooling off. It might need some other adjustments if you are using almond flour. I know it absorbs moisture quite a bit more than regular flour. Oh no! You are right. I’m not sure how we missed that. It was a mistake! The egg belongs there. Thanks! Just made these with the sub for honey suggested here by Sara – a second banana & 1/3c pure maple syrup. They came out SUPER green, and my twin 2yo boys gobbled it up like it was dessert. I’ve pinned this recipe – thanks SO much for helping to sneak in veggies at every turn ???? Just wanted to say thanks for this recipe. It is a staple in our house. I love that I can get a good serving of spinach into my picky eater. I’ve added hemp hearts, oats, and use coconut oil/applesauce and almond milk to adjust for allergies. I also add raisins because I love raisins in all my muffins. I’ve made them for birthday parties and have been asked for the recipe many times. I couldn’t find the serving size- is it 140cal/muffin? I just made these and they are amazing! My one year old keeps asking for more. What is the best way to store these muffins? These spinach muffins are definitely one of the most popular recipes on our site. So glad you liked them! They store really great in an airtight container in the freezer. Just let them thaw on the counter or reheat in the microwave about 30 seconds per muffin. I just wanted to chime in! My kiddos (8 and 10yo) have made these 5 or 6 times. We love them! Thank you! We use a 10 oz bag each recipe because that’s what we buy it in. 😀 Also, they forgot cinnamon once time, still good. They forgot butter once time. Slightly drier but still good, so it’s a forgiving recipe! Ok so I should have actually read the whole article because I ended up putting only one cup of spinach in this recipe which is what 6 oz translated to when I converted. So legit put a full bag in then? What size bag? So confused. Regardless they turned out great lol! Just made some small pancakes out of my left over muffin batter ? I made these muffins which were very nice however my mixture was a lot more wet. Not sure why. Also in the video, no egg was added so was that a printing error in the recipe ingredients? video error! Follow the written recipe for sure! THANKS! What can I use instead of baking powder? My hubby can’t have it. Also, would subbing coconut flour be the same ratio? Thankyou!!! I haven’t had luck with coconut flour as a substitute. Everything I have tried has not come out as intended. And a little extra baking soda should be oK! Just made a batch using heritage Red Fife whole wheat flour. A hit!! My 18 month old just ate 4 mini muffins, gobbled them down and demanded more. I don’t have a banana, but I do have apples. Could I substitute them for the banana? If so, how much? Thank you. I know you can replace a banana for applesauce in breads and muffins, so I would assume you could do the same thing with a whole apple if it is getting blended. I would probably do 1 apple for 1 banana and blend the apple first before adding the remaining ingredients. Let us know how it turns out! My extremely picky, to the point of problem eater, giggled after the first bite of his “monster muffin!” I’ve never actually seen him finish an entire muffin before this one, even ones with chocolate chips! He stole mine from me too! These are delicious and I will be saving this recipe to make over and over again! I did do one slight change, we did not have unsalted butter on hand, so I used regular butter and omitted the salt. They turned out beautifully! Can i use maple syrup,? You can try that Ain! Would I be able to add in some carrots to the blender with the wet ingredients and the consistency would stay alright? Trying to get any veggies I can into my picky eater! Thanks so much! Good to know that the flavor wasn’t too strong! Followed the recipe and they turned out amazing….I have ate like 4 on my own already ? they are delicious! Just made these in a mini muffin pan and accidentally forgot the honey…still delish and now lower in sugar. Thanks! Would love to make these, would anyone happen to know how to turn this into a vegan recipe, especially alternatives for the wet ingredients? Thank you! Does it need to be whole wheat flour? Not sure what a difference it would make as far as taste goes if we used 1 to 1 gluten free all purpose baking flour. My kiddos have a gluten allergy but i think they would love the idea of these! Hi Sara, some of our readers have had success using different flours in these muffins, including GF flour. Give it a try! Do you use fresh/cooked/frozen spinach? I use fresh bagged baby spinach. Often times you can buy a bag that weighs 5-6 ounces and just dump the whole thing right into the blender. In making these for my 9 month old, I want to avoid the honey for safety — anyone have a good substitution? Should I just use sugar? or apple sauce? I assume agave would work but I don’t have it on hand… Or leave it out? Was wondering about spinach. What do you use, frozen? or cooked fresh? Hi Andrea, I haven’t tried almost flour personally, but if you choose to experiment, please come back and let us know how it turns out! My 2yo DD is OBSESSED with these “Rocky cakes” (We are deep in the trenches of Paw Patrol Love). She will eat 2 or 3 in a row. I threw in an extra banana, and 1oz of flax seeds to get some extra nutrients. Thank you very much for this recipe. She NEVER eats veggies anymore. This has lowered my stress level about healthy eating a lot. I’m so glad you had success with these, Alicia! Thanks for sharing, and keep up the good work. Hi, can I use self raising flour and omit the baking powder & baking soda? Hi Annie, I haven’t tried the recipe this way, but I think using self-rising flour would probably work. If you try it, please let us know how the muffins turn out! These look awesome. I’m excited to try them, will use some of the suggestions to keep vegan, like Earth Balance for butter, coconut milk for dairy milk, and “flax egg”. Also thinking about serving with a honey butter “frosting”. Thanks so much Ash, I’m so glad you like them! I have never frozen an recipe before. Sorry if this is a silly question but what’s the best way to defrost the muffins? I’m assuming the microwave but for how long? Hi Nikky, glad you like them! I usually defrost these muffins overnight in the fridge, but they’ll also defrost in the microwave, as you guessed. Just place one on a napkin and microwave it for 30 seconds. Hi, I won’t to try this but not sure about measurements. How much is a cup? Hi Kasia, 1 cup is equal to 8 ounces. So glad you like them Angele! Thanks for sharing. Mine don’t look as green as yours, is there a trick to make the bright green color solid throughout the muffin? Hi Christine! One thing that makes them super-green is making sure the wet ingredients are very well blended together before you add them to the flour mixture. If there are any visible flecks of green, the color won’t be evenly distributed in the final muffins. I hope this helps! Hi Michelle! I haven’t tried these with oat flour, so I really don’t know if that would work. You might have trouble getting the muffins to set and hold together. But I’m all about experimenting! If you try it, please come back and let us know how it turns out. Any idea what the beachbody (21 day fix) container counts would be? Hi Angela! One muffin is one serving. I’m not familiar with the beachbody container counts, so I’m afraid I can’t help you there. Best of luck! And I forgot the banana! Hopefully they’re still good! Anyway to make without egg? I made these for my 5 year old son and he loves them. They are a touch bland for me, can i add more honey or an apple as well as the banana to sweeten it up a bit? I dont have whole wheat flour, what would be a good substitute for it? Hi Dorissa, we like whole wheat flour because it adds fiber and vitamins to the muffins, and a texture sturdy enough to stand up to the spinach. But I think all-purpose flour would probably work, too. So good! My daughter has a severe egg allergy so I substituted 1/3 cup unsweetened applesauce for the egg and added some chia seeds. They came out great! Has anyone tried cocoa powder in these or icing on these? My kids LOVE these, plain, but now my daughter wants them for a shamrock cupcake cake…so I’m thinking of ways to decorate these for the party. Kristine, how fun! Cocoa powder would definitely turn the batter brown, so if you’re going for a green color that’s something to keep in mind. I think icing would be marvelous! In ur nutritional info, do u know what the % sugar is? (Rather than g per portion) or the portion size so that I can work it out? Hi Katie! Unfortunately we don’t caclulate % sugar in our recipes, but the serving size listed is one muffin. Hopefully this helps you calculate the info you need. Is there a way to make them without the butter so they are dairy free? Hi Becca! Good question. You could try coconut oil in place of the butter. It might bring its own flavor to the muffins, but it should still work. If you try it, please let us know how it turns out! We’ve been using this recipe for years now and my kids love it. However, for some reason it now says 3/2 teaspoons cinnamon, and I can’t remember what it used to say? How much cinnamon? Hi Margaret, sorry for the confusion! We made some big updates to our site over the weekend and it caused some technical issues with our recipes. Everything should be patched up now and the amounts should look normal again. Thanks for your patience! What I love about these muffins is that they’re super versatile! I’ve made them with all purpose flour, whole wheat flour, and half of each. I’ve made them eggless with a flax egg. I’ve made them dairy free with milk/butter substitutes. I’ve used applesauce in place of some of the banana (I was doubling the recipe and only had one banana). I’ve made them using honey and using all white sugar. Each time they’ve turned out great and the kids have eaten them up! Don’t be afraid to try out what works best for your family! Cool Angela, thanks for sharing! does the spinach count as dry or wet ingredient? you just blend the leaves or boil them first? Hi! Can I substitute the butter with anything lower fat? Maybe yogurt? Hi Patrice! I haven’t tried this myself, but I think some of our readers have replaced part of the butter with applesauce for a lower fat muffin, with good results.